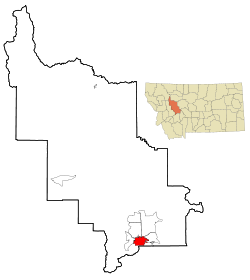 Helena (/ˈhɛlɪnə/) is the state capital of the U.S. state of Montana and the county seat of Lewis and Clark County. The local daily newspaper is the Independent Record. Semi-professional sports teams include the Helena Bighorns Tier III Junior A hockey team. The city is served by Helena Regional Airport (HLN). The Helena area was long used by various indigenous peoples. Evidence from the McHaffie and Indian Creek sites on opposite sides of the Elkhorn Mountains southeast of the Helena Valley show that people of the Folsom culture lived in the area more than 10,000 years ago. Before the introduction of the horse some 300 years ago, and since, other native peoples, including the Salish and the Blackfeet, utilized the area seasonally on their nomadic rounds. By the early 1800s people of European descent from the United States and British Canada began arriving to work the streams of the Missouri River watershed looking for fur-bearing animals like the beaver, undoubtedly bringing them through the area now known as the Helena Valley. Yet like the native peoples none of them stayed for long. 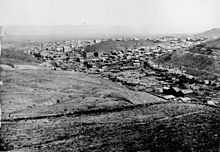 Gold strikes in Idaho Territory in the early 1860s attracted many migrants who initiated major gold rushes at Grasshopper Creek (Bannack) and Alder Gulch (Virginia City) in 1862 and 1863 respectively. So many people came that the federal government created a new territory called Montana in May 1864. These miners prospected far and wide for new placer gold discoveries. On July 14, 1864, the discovery of gold by a prospecting party referred to as the "Four Georgians", in a gulch off the Prickly Pear Creek led to the founding of a mining camp along a small creek in the area they called Last Chance Gulch. The original camp was named "Last Chance" by the Four Georgians. By fall, the population had grown to over 200, and some thought the name "Last Chance" was too crass. On October 30, 1864, a group of at least seven self-appointed men met to name the town, authorize the layout of the streets, and elect commissioners. The first suggestion was "Tomah," a word the committee thought had connections to the local Indian people. Other nominations included Pumpkinville and Squashtown (as the meeting was held the day before Halloween). Other suggestions were to name the community after various Minnesota towns, such as Winona and Rochester, as a number of settlers had come from Minnesota. Finally, a Scotsman named John Summerville proposed Helena, which he pronounced /həˈliːnə/ hə-LEE-nə in honor of Helena Township, Scott County, Minnesota. This immediately caused an uproar from the former Confederates in the room, who insisted upon the pronunciation /ˈhɛlɪnə/ HEL-i-nə, after Helena, Arkansas, a town on the Mississippi River. While the name "Helena" won, the pronunciation varied until approximately 1882 when the /ˈhɛlɪnə/ HEL-i-nə pronunciation became dominant and has remained so to the present. Later tales of the naming of Helena claimed the name came variously from the island of St. Helena, where Napoleon had been exiled, or was that of a miner's sweetheart. The townsite was first surveyed in 1865 by Captain John Wood. However, many of the original streets followed the chaotic paths of the miners, going around claims and following the winding gulch. As a result, few city blocks are consistent in size; rather they have an irregular variety of shapes and sizes. In 1870, Henry D. Washburn, having been appointed Surveyor General of Montana in 1869, organized the Washburn-Langford-Doane Expedition in Helena to explore the regions that would become Yellowstone National Park. Mount Washburn, located within the park, is named for him. Members of the expedition included Helena residents: Truman C. Everts - former U.S. Assessor for the Montana Territory, Judge Cornelius Hedges - U.S. Attorney, Montana Territory, Samuel T. Hauser - President of the First National Bank, Helena, Montana; later a Governor of the Montana Territory, Warren C. Gillette - Helena merchant, Benjamin C. Stickney Jr. - Helena merchant, Walter Trumbull - son of U.S. Senator Lyman Trumbull (Illinois) and Nathaniel P. Langford, then former U.S. Collector of Internal Revenue for Montana Territory. Langford helped Washburn organize the expedition and later helped publicize the remarkable Yellowstone region. In May 1872 after the park was established, Langford was appointed by the Department of Interior as its first superintendent. By 1888, about 50 millionaires lived in Helena, more per capita than in any city in the world. They had made their fortunes from gold. About $3.6 billion (in today's dollars) of gold was taken from Last Chance Gulch over a 20-year period. The Last Chance Placer is one of the most famous placer deposits in the western United States. Most of the production occurred before 1868. Much of the placer is now under the streets and buildings of Helena. (As late as the 1970s, when repairs were being made to a bank, a vein of placer gold was found under the bank's foundation). This large concentration of wealth was the basis of developing fine residences and ambitious architecture in the city; its Victorian neighborhoods reflect the gold years. The numerous miners also attracted the development of a thriving red light district. Among the well-known local madams was Josephine "Chicago Joe" Airey, who built a thriving business empire between 1874 and 1893, becoming one of the largest and most influential landowners in Helena. The brothels of Helena were a successful part of the local business community well into the 20th century, ending with the 1973 death of Helena's last madam, "Big Dorothy" Baker. The official symbol of Helena is a drawing of "The Guardian of the Gulch", a wooden fire watch tower built in 1886. It still stands on Tower Hill overlooking the historic downtown district. This fire tower replaced a series of observation buildings, the original being a flimsy lookout stand built in 1870 on the same site, built in response to a series of devastating fires: April 1869, November 1869, October 1871, August 1872 and January 1874 that swept through the early mining camp. On August 2, 2016 an arson attack severely damaged the tower and was deemed structurally unstable. The tower is to be demolished; however, it will be rebuilt using the same methods that were used in its original construction. The Montana State Capitol building. In 1889, railroad magnate Charles Arthur Broadwater opened his Hotel Broadwater and Natatorium west of Helena. The Natatorium was home to the world's first indoor swimming pool. Damaged in the earthquake of 1935, it was closed in 1941. The many buildings on the property were demolished in 1976. Today, the Broadwater Fitness Center stands just west of the Hotel & Natatorium's original location, complete with an outdoor pool heated by natural spring water running underneath it. Helena has been the capital of Montana Territory since 1875 and the state of Montana since 1889. 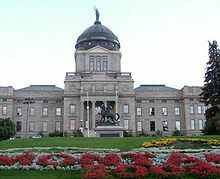 In 1902, the Montana State Capitol was completed. A large portion of the conflict between Marcus Daly and William Andrews Clark (the Copper Kings) was over the location of the state capital. Until the 1900 census, Helena was the most populated city in the state. That year it was surpassed by Butte, where mining industry was developing. In 1916, the United Daughters of the Confederacy commissioned the construction of the Confederate Memorial Fountain in Hill Park. It was the only Confederate memorial in the Northwestern United States The fountain was removed on August 18, 2017 after the Helena City Commission deemed it a threat to public safety, following a white nationalist rally in Charlottesville, Virginia. The Cathedral of Saint Helena and the Helena Civic Center are two of many significant historic buildings in Helena. Numerous Helenans work for various agencies of the state government. When in Helena, most people visit the local walking mall. It was completed in the early 1980s after Urban Renewal and the Model Cities Program in the early 1970s had removed many historic buildings from the downtown district. During the next decade, a three-block long shopping district was renovated that followed the original Last Chance Gulch. A small artificial stream runs along most of the walking mall, to represent the underground springs that originally flowed above ground in parts of the Gulch. The Archie Bray Foundation, an internationally renowned ceramics center founded in 1952, is located just northwest of Helena, near Spring Meadow Lake. A significant train wreck occurred in 1989. With the mountains, Helena is the location for much outdoor recreation, including hunting and fishing. It has a local ski area, Great Divide Ski Area, northwest of town near the ghost town of Marysville. Helena is also known for its mountain biking. It was officially designated as an International Mountain Bicycling Association bronze level Ride Center on October 23, 2013. Helena High School and Capital High School are public high schools located in the Helena School District No. 1. In 2017 Helena voters elected as mayor, former Liberian refugee Wilmot Collins, who was widely reported as Helena's first black mayor. The Independent Record reported contested research indicating that in the early 1870s one E. T. Johnson, listed in the city directory as a black barber from Washington D.C., had been elected mayor, before Helena became an incorporated town. 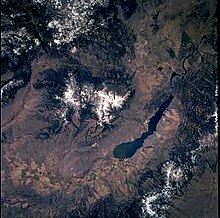 Helena is located at 46°35′45″N 112°1′37″W﻿ / ﻿46.59583°N 112.02694°W﻿ / 46.59583; -112.02694 (46.595805, −112.027031), at an altitude of 4,058 feet (1,237 m). 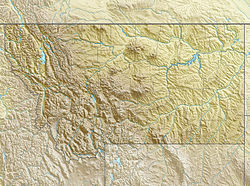 Surrounding features include the Continental Divide, Mount Helena City Park, Spring Meadow Lake State Park, Lake Helena, Helena National Forest, the Big Belt Mountains, the Gates of the Mountains Wilderness, Sleeping Giant Wilderness Study Area, Bob Marshall Wilderness, Scapegoat Wilderness, the Missouri River, Canyon Ferry Lake, Holter Lake, Hauser Lake, and the Elkhorn Mountains. 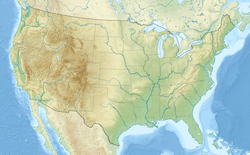 According to the United States Census Bureau, the city has a total area of 16.39 square miles (42.45 km2), of which 16.35 square miles (42.35 km2) is land and 0.04 square miles (0.10 km2) is water. Helena has a semi-arid climate (Köppen BSk), with long, cold and moderately snowy winters, hot and dry summers, and short springs and autumns in between. The monthly daily average temperature ranges from 21.8 °F (−5.7 °C) in December to 70.0 °F (21.1 °C) in July, with average diurnal temperature variation exceeding 30 °F (17 °C) in summer, due to the aridity and elevation. Having December colder than January is a trait shared with much of the Pacific Northwest. Snowfall has been observed in every month but July, but is usually absent from May to September, and normally accumulates in only light amounts. Winters have periods of moderation, partly due to warming influence from chinooks. Precipitation mostly falls in the spring and is generally sparse, averaging only 11.3 inches (287 mm) annually. Subzero (below −18 °C) cold is observed 23 nights per year, but is rarely extended, as is 90 °F (32 °C) heat, which occurs on 19 days annually. Extremes range from −42 °F (−41 °C) to 105 °F (41 °C), occurring as recently as February 2, 1996 and July 12, 2002, respectively. As of the census of 2010, there were 28,190 people, 12,780 households, and 6,691 families residing in the city. The population density was 1,724.2 inhabitants per square mile (665.7/km2). There were 13,457 housing units at an average density of 823.1 per square mile (317.8/km2). The racial makeup of the city was 93.3% White, 0.4% African American, 2.3% Native American, 0.7% Asian, 0.1% Pacific Islander, 0.6% from other races, and 2.6% from two or more races. Hispanic or Latino of any race were 2.8% of the population. There were 12,780 households of which 24.3% had children under the age of 18 living with them, 38.2% were married couples living together, 10.6% had a female householder with no husband present, 3.6% had a male householder with no wife present, and 47.6% were non-families. 39.8% of all households were made up of individuals and 13.5% had someone living alone who was 65 years of age or older. The average household size was 2.07 and the average family size was 2.77. The median age in the city was 40.3 years. 20.1% of residents were under the age of 18; 11.6% were between the ages of 18 and 24; 23.3% were from 25 to 44; 29.5% were from 45 to 64; and 15.6% were 65 years of age or older. The gender makeup of the city was 48.0% male and 52.0% female. As of the census of 2000, there were 25,780 people, 11,541 households, and 6,474 families residing in the city. The population density was 1,840.7 people per square mile (710.5/km²). There were 12,133 housing units at an average density of 866.3 per square mile (334.4/km²). The ethnic makeup of the city is 94.8% White, 0.2% African American, 2.1% Native American, 0.8% Asian, 0.1% Pacific Islander, 0.4% from other races, and 1.7% from two or more races. 1.7% of the population were Hispanic or Latino of any race. There were 11,541 households out of which 27.1% had children under the age of 18 living with them, 42.5% were married couples living together, 10.4% had a female householder with no husband present, and 43.9% were non-families. 37.5% of all households were made up of individuals and 11.3% had someone living alone who was 65 years of age or older. The average household size was 2.14 and the average family size was 2.83. In the city, the population was spread out with 22.4% under the age of 18, 11.1% from 18 to 24, 26.6% from 25 to 44, 26.0% from 45 to 64, and 13.9% who were 65 years of age or older. The median age was 39 years. For every 100 females, there were 91.0 males. For every 100 females age 18 and over, there were 87.6 males. The median income for a household in the city was $34,416, and the median income for a family was $50,018. Males had a median income of $34,357 versus $25,821 for females. The per capita income for the city was $20,020. About 9.3% of families and 14.5% of the population were below the poverty line, including 16.4% of those under age 18 and 8.3% of those age 65 or over. Helena has a long record of economic stability with its history as being the state capital and being founded in an area rich in silver and lead deposits. Its status as capital makes it a major hub of activity at the county, state, and federal level. Thirty-one percent of the city's workforce is made up of government positions with private sector jobs comprising 62 percent. According to the Helena Area Chamber of Commerce, the capital's median household income is $50,889, and its unemployment rate stood at 3.8% in 2013, about 1.2% lower than the rest of the state. Education is a major employer, with two high schools and accompanying elementary and middle schools for K-12 students as well as Helena College. Major private employers within the city of Helena include Carroll College and the medical community. Helena's economy is also bolstered by Fort William Henry Harrison, the training facility for the Montana National Guard, located just outside the city. Fort Harrison is also home to Fort Harrison VA Medical Center, where many Helena-area residents work. Within Lewis and Clark County, there also remains one mineral processing plant and several light manufacturing facilities, including a division of Boeing. Carroll College, a Catholic liberal arts college which opened in 1909, enrolls 1,500 students. Helena College University of Montana, a two-year affiliate campus of The University of Montana, provides transfer, career, and technical education for more than 1,600 students. It opened in 1939. Helena's Designated Market Area is 205th in size, as defined by Nielsen Media Research, and is the fifth smallest media market in the nation. Wilmot Collins, First black mayor in Montana. Decius Wade, the "Father of Montana Jurisprudence"
Vice Admiral Donald Bradford Beary, Dec 1888 March 1966 (U.S. Navy), Vice Admiral, Implemented Sea Replenishment World War II. ^ MacDonald, Douglas H. (2012). Montana before history : 11,000 years of hunter-gatherers in the Rockies and Plains. Missoula, Mont. : Mountain Press Pub. Company. pp. 38–44. ISBN 9780878425853. ^ Baumler, Ellen (2014). Helena, The Town That Gold Built: The First 150 Years. San Antonio, TX: HPNbooks. p. 28. ^ Holmes, Krys (2008). "Chap. 5, Beaver, Bison, and Black Robes: Montana's Fur Trade, 1800-1860". Montana : stories of the land (PDF). Helena, MT: Montana Historical Society Press. pp. 80–89. Retrieved 20 February 2014. ^ Baumler, Ellen (2014). Helena, The Town That Gold Built: The First 150 Years. San Antonio, TX: HPNbooks. pp. 6–7. ^ a b Bridge, Thom (July 4, 2015). "Helena officials to discuss Confederate memorial fountain". The Montana Standard. Retrieved April 6, 2017. ^ "On Aug. 18 Helena's Confederate fountain was removed. Here's our coverage". Helena Independent Record. Retrieved 2018-03-30. ^ a b Bridge, Thom (November 8, 2017). "Will Helena's Wilmot Collins be Montana's first black mayor? Not exactly, historians say". Archived from the original on November 11, 2017. ^ a b c "NOWData - NOAA Online Weather Data". National Oceanic and Atmospheric Administration. Retrieved 19 February 2015. ^ "MT Helena RGNL AP". National Oceanic and Atmospheric Administration. Retrieved 19 February 2015. ^ "WMO climate normals for Helena/County-City, MT 1961−1990". National Oceanic and Atmospheric Administration. Retrieved 19 February 2015. ^ Moffatt, Riley. Population History of Western U.S. Cities & Towns, 1850-1990. Lanham: Scarecrow, 1996, 131. ^ "Population Estimates". United States Census Bureau. Archived from the original on October 19, 2016. Retrieved July 14, 2016. ^ "Helena: Economy - Major Industries and Commercial Activity". City-data.com. Retrieved 2012-08-13. ^ "Helena, Montana – Small Community Air Service Development Grant Application – April 2007" (PDF). AirlineInfo.com. Helena Regional Airport Authority. Retrieved 1 March 2016. ^ Chaney, Jesse. "Government jobs help stabilize Helena's housing market". billingsgazette.com. Billings Gazette. Retrieved 1 March 2016. ^ "Schools in Helena, Montana". Retrieved 2010-11-19. ^ "Max Baucus". Biographical Directory of the United States Congress. Retrieved 14 October 2012. ^ "Thomas Henry Carter". Biographical Directory of the United States Congress. Retrieved 14 October 2012. ^ "William H. Clagett". Biographical Directory of the United States Congress. Retrieved 14 October 2012. ^ "Yellowstone National Park: Its Exploration and Establishment Biographical Appendix". National Park Service. July 4, 2000. Retrieved 2009-09-28. ^ "Rick Hill". Biographical Directory of the United States Congress. Retrieved 14 October 2012. ^ "Scientology Founder L. Ron Hubbard, Quote of the Week, Video Biography". Scientology.org. 2011-07-20. Archived from the original on 2010-01-09. Retrieved 2011-11-14. ^ "James F. Lloyd". Biographical Directory of the United States Congress. Retrieved 14 October 2012. ^ "Henry H. Schwartz". Biographical Directory of the United States Congress. Retrieved 14 October 2012. ^ "George G. Symes". Biographical Directory of the United States Congress. Retrieved 14 October 2012. ^ "Thomas J. Walsh". Biographical Directory of the United States Congress. Retrieved 14 October 2012. ^ "John Patrick Williams". Biographical Directory of the United States Congress. Retrieved 14 October 2012. ^ Kiki Leigh Rydell; Mary Shivers Culpin (2006). "Administration in Turmoil-Yellowstone's Management in Question 1907-1916". Managing the Matchless Wonders-History of Administrative Development in Yellowstone National Park, 1872-1965 YCR-CR-2006-03. National Park Service, Yellowstone Center for Resources. pp. 51–74. Wood, Anthony. "After the West Was Won How African American Buffalo Soldiers Invigorated the Helena Community in Early Twentieth-Century Montana." Montana 66.3 (2016): 36-50. 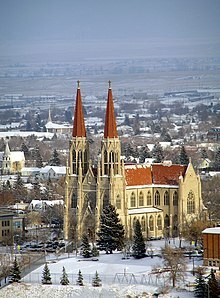 Wikimedia Commons has media related to Helena, Montana. Wikisource has the text of a 1911 Encyclopædia Britannica article about Helena, Montana. 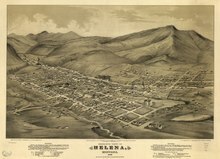 "Helena, Montana". C-SPAN Cities Tour. November 2013.